A few weeks ago, when I first read about the swap, I jumped in right away. 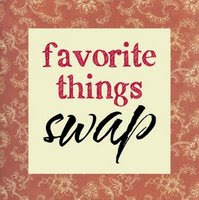 I've never participated in a swap before and it sounded like so much fun. A little while later I started mulling over which of my many favorites to share. It certainly was difficult to narrow my extensive list. I won't give anything away, yet, because the package just went out today. I decided to make most of my items since I enjoy working with paper, stamps, ink and all the fabulous embellishments. In my spare time these last few days I was able to get a few things made. Late last night these strange feelings invaded, rooted I'm sure in my insecurities. What if she doesn't like it? What if our tastes are completely different?, etc. I was doubting my decision to send handmade items to someone I don't know really know much about. Silly I know, but those doubts were assaulting me. This morning I came full circle by realizing that the overall purpose of this swap is to get to know fellow bloggers a little better, meet someone new and share a bit of our lives. Discover things we have in common and discover something new. Connect. Relate. Share. It is for fun, therefore insecurities are no longer allowed. I let them go and mailed off my packages with a sense of excitement. I can't wait for her to receive them and I can hardly wait to discover her favorite things! Have you ever participated in a swap before? What was your experience like? i had those same worries as i packed up my things to send! i had to remember that i would genuinely like to receive these items myself and they are some of my favorite things. i think handmade items are some of the most precious gifts i've ever received. you learn about the person they came from and there is an amount of time and effort that goes into them that can't be calculated. The Favorite Things Swap was my 1st and I'm glad I did it! I received my package yesterday and was thrilled with the items, both handmade and store bought. This was my first! It's hard know whether or not someone will like something you send them - but I guess I see it that it's better than nothing! Can't wait to see everyone's swap stuff! i totally know and understand the feeling... it's so easy for insecurities to creep in. who would have thought that something as simple as a swap could evoke such feelings? but in the end, it is all about connecting, making new friends, and hopefully learning a bit about yourself. at first it seems like picking your favorite things would be easy... but then, when you really start to think about, it was definitely a lot harder for me than i ever expected.